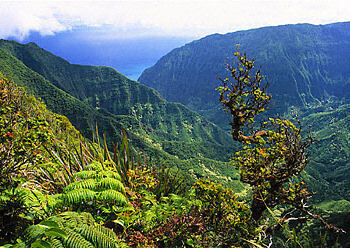 The Hawaiian High Islands Ecoregion lies in the central north Pacific Ocean. 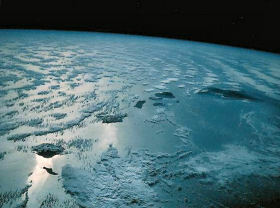 Remarkable physiographic and climatic diversity marks the ecoregion. Some of the world's wettest regions lie in the ecoregion's montane systems. 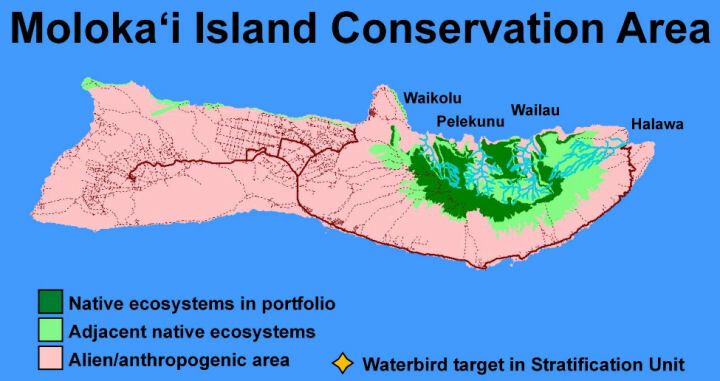 Following the portfolio assembly rules described in the Goalssection of this assessment, a series of ecological system, naturalcommunity, and species concentration targets wereselected, comprising the portfolio of conservation areas for theHawaiian High Islands Ecoregion. The geospatial representation at thearchipelago scale is shown in the map below and available at higher resolutionamong the Maps & Figures. 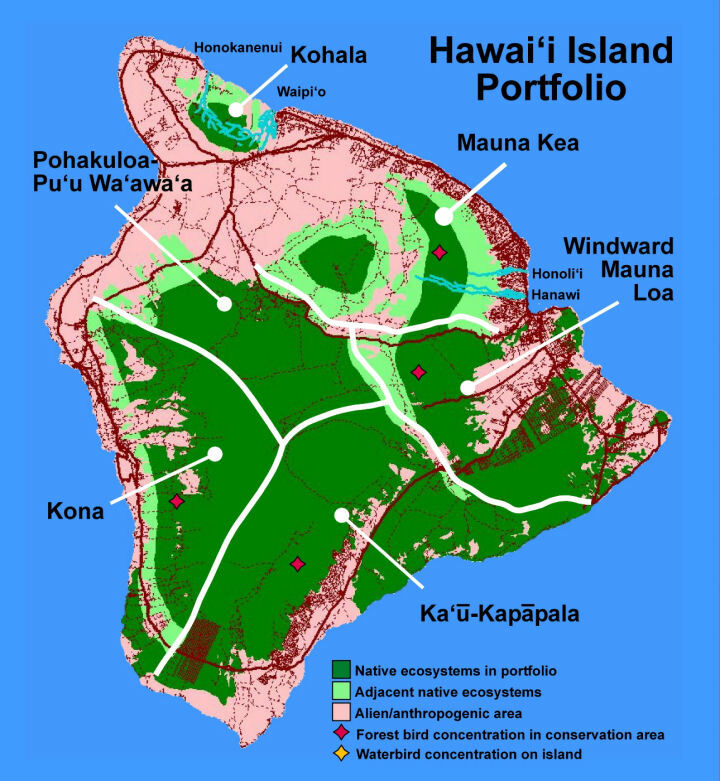 Theselected conservation areas, which represent the primary arena forTNC's ecoregional efforts, occur on all of the main islands exceptfor Ni‘ihau, Kaho‘olawe, and Lāna‘i. 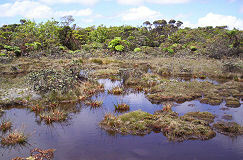 While the ForestBird Concentrations for each Stratification Unit typically overlapstrongly with montane mesic and wet ecological systems of theecoregion's conservation areas, the Waterbird Concentrations tend tooccupy alien-dominated coastal and lowland wetlands outside of the viable ecological system areas. The portfolio of conservation areas selected comprise the largest and most viable set of areas for establishing effective conservation(legal protection + abatement of critical threats, and maintenance of ecological processessupporting native biodiversity). They reflect the highest priorityareas for the work of The Nature Conservancy, focused on maintaininghigh-viability native ecological systems and the thousands of species withinthem. However, this is not intended to deter or discouragework outside of the portfolio. Important partner-led complementary conservationaction is needed in other areas, particularly for rare, threatened and endangered species. Elements of biological diversity, especially at the species level,occur in regions no longer dominated by native natural communities.These populations require specific management, includingspecies-focused threat abatement and habitat restoration. For example,the restoration work on the Island of Kaho‘olawe by the Kaho‘olawe Island Reserve Commission and its partners isessential for the recovery of that island's native biologicaldiversity. 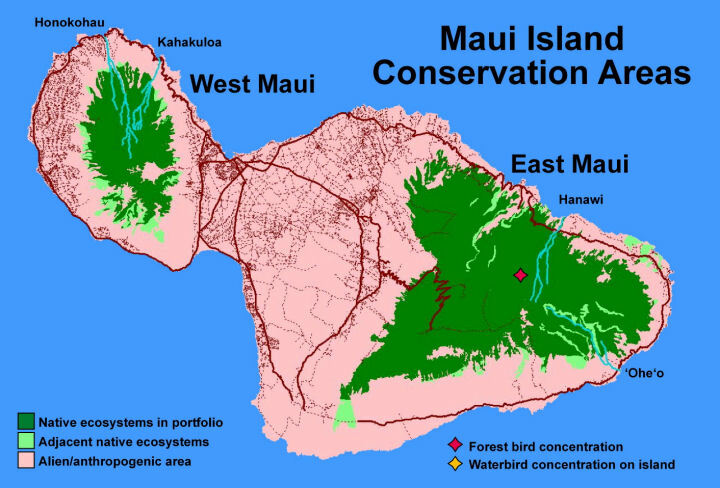 Additionally, our federal conservation partners are mandatedto recover 300+ threatened and endangeredspecies endemic to Hawai‘i. The Nature Conservancy looks topartners with specific mandates for species management or wholesale ecosystem restoration to lead in thoseessential areas. Whilethe selection of a portfolio of conservation areas is one way toestablish geospatial priorities for conservation work, the long-termnature of ecoregional conservation also allows us to define highestpriority areas, via assessment of conservation value, threats, and enabling factors. This process is discussed in the next section defining TNC Action Sites. 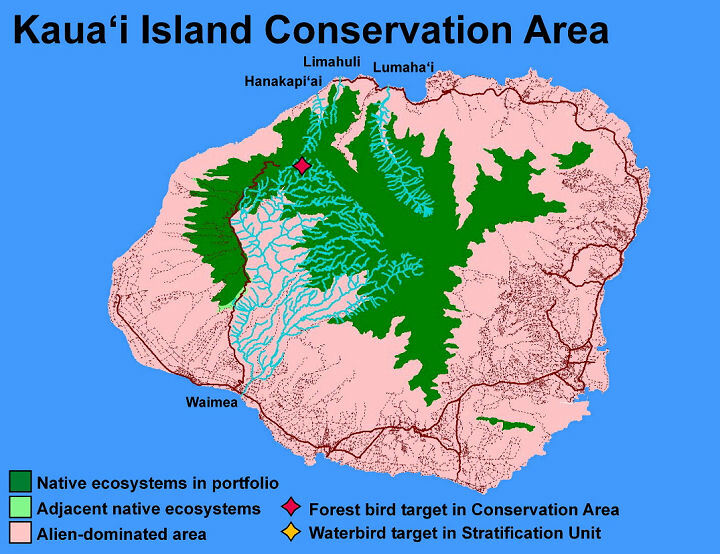 Themap of the portfolio of conservation areas (below) demonstrates thatover half of the land area of the Hawaiian Islands is needed as anarena for effective conservation. Dark green regions arenative-dominated ecological systems selected as conservation targets.Pink regions are anthropogenic or alien-dominated. 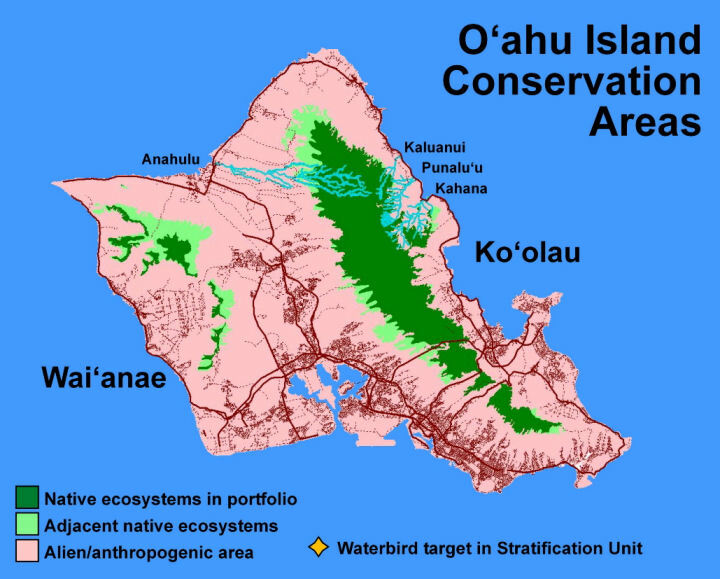 Selected continuousperennial streams are not easily distinguished atthis scale, but can be seen in maps of each of the stream-bearingislands of Kaua'i, O'ahu, Moloka'i, Maui, or Hawai'i (click on any ofthem below). Forest bird concentrations are indicated with redstarswithin their respective conservation areas, and ayellow star indicates presence of waterbirdconcentration areas on one or more islands within each StratificationUnit. coastal assessment - add a mapping of coastal targets, and discussionof the selection of target subsets to reflect coastal portfolio.